Monsoon has finally hit Mumbai, so now we are all busy updating our wardrobe with a checklist in hand to buy wet shoes, toe bags, outfits and funky raincoats, but aren’t we missing a very important product in our favourite rainy-day accessories, let me give you a hint— some stylish Umbrellas for women. Many times, umbrellas take a back seat in fashion. The amount of time & energy we spent on selecting our rainy outfits and wet shoes, we don’t apply the same time & energy for selecting an umbrella for ourselves. If you think any umbrella will do the trick as it is just a shelter to save oneself from rains, then I guess it’s time for you to smell some coffee. Nowadays these shelters are getting the much-deserved limelight they ever had. Hence, using an umbrella is now no longer a boring chore, in fact, it’s becoming an important fashion statement. Following are the six stylish umbrellas for women you can pair with your rainy outfits to get the freshest look in this rainy season. No matter how much it rains, you can still maintain a good mood wherever you go with this umbrella. The most beautiful thing about this is when it meets the rain you can actually feel the raindrops closer when it is pouring adding romance and beauty in the rains. If you are travelling carrying this umbrella, you will become a part of a beautiful scenery itself. It’s lightweight to hold, made out of PVC material and convenient to hang up when folded. Be an eye catcher by wearing a casual regular fit short with full sleeve shirts or a wrap-up skirts with plain V neck tops and a cute pair of t-strap sandals. 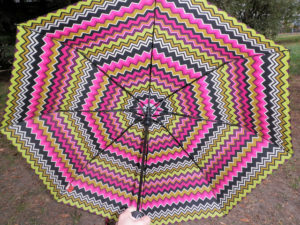 Rainy days don’t have to be boring anymore with this well-made and well-designed checkered pattern umbrella. Made from 100% polyester pongee waterproof fabric which can withstand harsh weather conditions. Don’t worry if it is raining heavily or just drizzling you will feel protected under this umbrella for sure. It Comes in different attractive colour. This three-fold umbrella can be easily stored in your handbags while you are on the go. So, very convenient to carry it with you everywhere. Step out with this umbrella wearing a black jegging with full sleeve shirts and jacket with a stylish stole around your neck to keep yourself warm in this cold rainy weather and a nice pair of ballerinas to keep yourself safe and enjoy the rains days. A strong and sturdy umbrella that will help you to battle the wind and rain and keep you dry while going to the office. The plain solid colour umbrella adds your style. Made from nylon fabrics and coated on the inner side for UV protection, it is fully waterproof. It is Lightest & smallest and has a soft grip handle for a comfortable holding while walking or travelling. Let the breeze flow, let the sunshine & the rain pour, you still be in a safe shelter. An excellent umbrella It’s a great combination of portability, protection and, durability. Perfectly designed for you. Get a classic neutral look in the rain with this umbrella, by wearing a camel coat and hunters with polo neck full sleeve t-shirt and a smart pair of black gumboots. Presenting a stylish, trendy & elegant looking polka dot umbrellas to carry this monsoon. 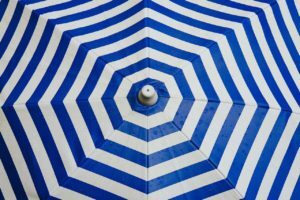 A sturdy yet lightweight polka dot umbrella helps get you where you are going without having to worry about the weather. They are durable, windproof and easily slices through all harsh rainy winds to keep you safe. These exclusive series of polka dot umbrellas for women are bordered with an elegant decorative frill making them stylish to suit every girl or women and are simply perfect for any occasion. Click a selfie with this good cute umbrella by wearing blue jeans with a white t-shirt and denim shirt or a stunning waist dress with red gumboots. This exclusive collection of breath-taking printed umbrellas for women is a very good company for you in the rainy season. It gives you plenty of room to cover yourself from rain and wind. A three-fold umbrella is a fix in most handbags. A high-quality cloth and sturdy frame in this umbrella are built to protect you from rains and winds. They have a very smooth and even finish. Available in various vibrant colours and patterns. This good-looking umbrella will give you a perfect selfie or a stunning post for social media. A very classy choice to choose. Dare to go bold and beautiful this rainy season by wearing a plaid skirt, jumper with a white shirt and long black coat. 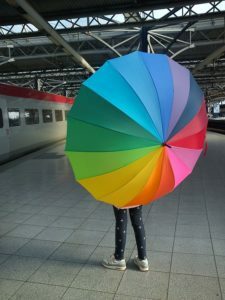 Whether you are hopping through the puddles or bouncing to the bus stop, you will love venturing out into rain carrying the rainbow umbrella with yourself. With its gorgeous colours, it brings much fun and happiness in the rainy days. It’s very convenient for you to bring and use anywhere. Hence, a perfect choice of umbrella for women and girls to use this monsoon. Go out with this umbrella wearing a dungaree and white t-shirt with a nice pair of anklet rain boots and simply enjoy the rains. I am very sure with these stylish Umbrellas for women in hand, you will look forward to the rains rather than detesting them. This year’s monsoon is giving you a perfect opportunity to flaunt your designer umbrella and make you stand out in the crowd.